I had a very quick trip to Deer Lake and back last Friday and Saturday. I had been invited by Carole Spicer to talk about heritage at the annual general meeting of the Grand Lake Centre of Economic Development. I was treated to their roast beef dinner and then talked about what heritage means to communities, demonstrating the links between our architectural heritage and our intangible cultural heritage, oral history, and folklore. The audience was mostly made up of local volunteers, community workers, and councillors from the surrounding communities. One of the points I made was that while not every town has heritage buildings, every town has heritage of some kind that is worth safeguarding. Sometimes communities get focussed on heritage places or running a community museum to preserve artefacts that they forgot that local stories, skills, and knowledge are just as important. 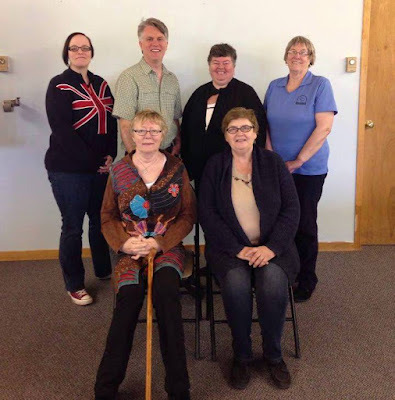 They put me up at a local AirBNB, and then on Saturday morning we met back the Grand Lake Centre of Economic Development (a great spot to rent if you are looking for meeting space in the area) for a heritage workshop, with representation from Cormack, Reidville, Deer Lake and Pasadena. We talked about oral history, digitizing collections, and community mapping. I gave examples of what is happening with other communities across Newfoundland and Labrador, and talked about how communities can better engage local people and turn collected stories and oral histories into more participatory community events. We had a great chat about identifying local heritage assets, war brides, cultural diversity, agricultural history, and jam making! Several topics seemed to generate the most discussion, including the need to work more on a regional heritage cluster or region, and the need for some community mapping to identify local heritage places and traditions. So, I expect you will hear more about work in the Humber Valley area! I’m planning on heading back later this summer to run a train-the-trainer session on our “People, Places, and Traditions” workshop, so that a series of community mapping sessions can be carried out in communities in the valley. Stay tuned! Want a heritage workshop for your community? Email me at ich@heritagefoundation.ca.